*Keep a disposable camera in your purse/bag/coat pocket/etc any time you go out. This is not meant to replace your "real" camera or your iPhone, only an extra little memory keeper. *Don't be afraid of flash/nighttime photography. I think that's part of what makes a throw away camera great-- you don't have to be worried about graininess or laser eyes from the flash. That's part of the charm! What do you think? Anyone want to play along? It will take us all probably a month or two to fill one up, so the pay off will take a awhile. 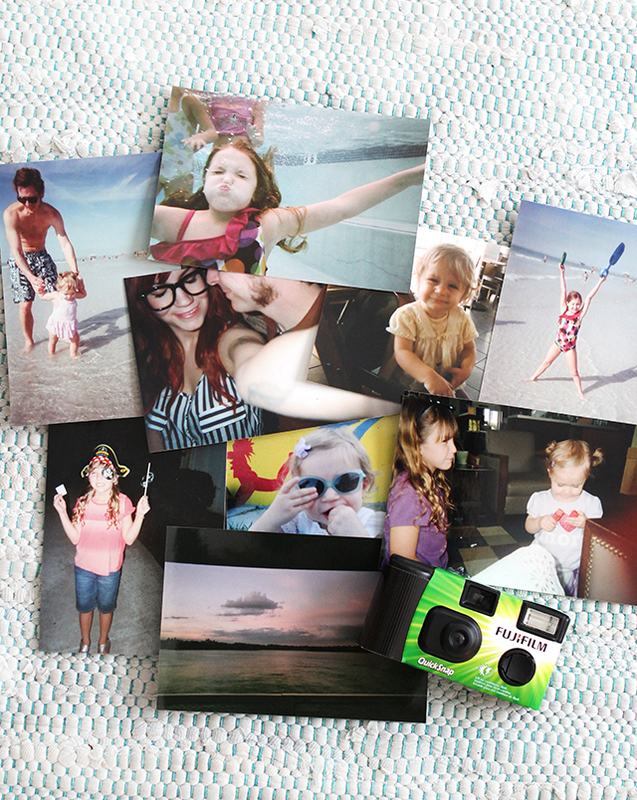 Once I get photos developed, I'll definitely share (and would love it if you did, too)! I'm excited to be doing this again-- it's going to be fun! this is such a great idea. i might just have to!! That's so funny, I used to do that a lot too but haven't in a while then planned to buy one over the weekend and never did! I'm definitely doing the challenge with you now! This is a great idea! The ritual of taking pictures, waiting to finish a roll of film, taking the film to get developed is great! It's the little things like that that using digital all the time makes us forget! I also have a bunch of old cameras i need to go get developed. Maybe this will inspire me. What a great idea! I would love to participate in this challenge! I'm definitely in! Miss those days of the throwaway camera. I'm definitely in! I miss those good old days of disposable camera fun. This is absolutely an adorable idea! Man back in the day I used to rock some disposable cameras. I'm definitely in for this challenge! what a fun idea! i need to try this! Love this! I'm in a photography class this semester and we've been working with film cameras and it's so weird and fun to change things up a bit. It's definitely a challenge! I'm in! I love finding old disposable cameras and getting them developed without having a clue what's gonna be on them. This is gonna be fun! Love this! Have you heard of the app "Disposable"? It's kind of the same idea, just in an app form. You're not able to view the photos until you have completed the roll of film. It's fun because you can also share a camera roll with a friend, and they can take photos too! Check it out! I have been trying to do this project since June! I am failing miserablly, I put a time limit on each camera to one month each, which is unrealistic! I do love the forgotten shots that turn out amazing and recreate the memory! I have three cameras waiting to be developed!! I don't think I will stop, but like you may just allow myself time to get through a roll- especially as I am expecting my first baby in June, it will be magical to capture some of those moments! This is such a nice idea, it's nice to go back to the old school sometimes. Currently I am thinking about buying disposable cameras. But it's gonna be for another purpose :) I decided to make a little scavenger hunt for all the kids who will come to our wedding. We will find out pictures for about half of the roll (the actual photo scavenger hunt part), and the other half of the roll will be there for their own ideas. This way, we will have photos from unique angles (kids :)), besides of course the official photographers. Such a fun idea! I always have my instax mini on hand but I like the idea of developing later on and looking back! I used to always LOVE using disposable cameras, especially those awesome underwater ones! I will join this challenge, sounds fun! THanks! This is such a fantastic idea! Thanks for sharing it! When my friend from TX came to visit last year and we took a mini road trip around CA, we each took 2 disposable cameras with us and shared our prints at the end. It was so much fun and I love the grainy, out of focus quality to the prints haha. It was such a memorable thing to do, as well. It will be fun to see how it comes out spacing out the 24-27 shots over the course of a month! What a great idea! I was clearing out some drawers the other week and found this old 'Mamma Mia The Movie'-merchandise disposable camera. The film probably expired years ago but that'll just make it even more fun. Have you set a deadline for the challenge? I'm actually doing this right now! Well, sort of. It's a big challenge not to take one or more photos of the same thing. What a fun idea! I love disposable cameras. I need to get in the habit of taking photos again! I love this idea! Sadly though most of the places that develope film are closing near me. :( If I can find a place that I know isn't going to close their film developing any time soon, I 110% want to take part in this! I am SO down for this! I'm ready for the challenge! Yes! This is just the perfect excuse to buy a camera and have fun around the city! I used to do that too! I love how the photos come out, they have such a nice feel to them. And it's definitely fun being surprised! Count me in! Love this idea. Developing it months later and going through the photos remembering all those great little moments that would have otherwise been long forgotten. Love this. Love this idea!!! I always have a camera with me...but I rarely get images printed! And I do take a lot of pictures! :) Will buy a disposable camera ASAP! Doing this! I used to do this all the time before I finally got a smart phone 2010 (I took forever). I'll do it with my boyfriend! I've been wanting to do this with him for a while anyways!!! We forgot our "real" camera on our honeymoon so we relied on disposable ones. I wouldn't trade those pictures for anything. Definitely will be joining this challenge! :D Thanks for the idea!!!! I love this idea. I'm in! YES! Such a great idea. Sounds like so much fun. I'm in! Oh, this sounds like far too much fun. Once I stop traveling so much I will try to start this. It would be just like me to accidentally let the camera go through TSA and lose everything. I've been meaning to do this! I'm definitely going to now! Check this blog out, she reminded me so hard of you! Great idea! I actually found a camera that I'm pretty sure I was using 3 years ago. It has 9 pictures left on it and I can't wait to see what's on there! I love carrying around a disposable camera! Lately I've been trying to use my Holga more, so I've been bringing it out with me, but the film is SO expensive. Maybe disposable cameras are a better option! Yes yes yes yes yes! I am going to do this! I'm keen to do this. I haven't taken pictures with a disposable camera in forever. Sounds like fun! I used to do this!! I have several albums from high school and college with one or a handful of photos from each place or event. It's a perfect "snapshot" of life back then! Love the idea for now, too! This sounds so awesome, I'm definitely in! I like this idea, will join in too! I love disposable cameras! I already started doing this some time ago and I am super excited every time I get my film developed. I will take your advice of only taking 2-3 pictures in one situation, cos that is definitely more interesting! How neat! I love this! I have a disposable camera I bought on sale at Micheal's a while back I haven't used. I'm going to have to pull it out and have fun with it! I used to do this when I was younger! Definitely up to doing it again. Love this idea. Going to Copenhagen soon so will take a disposable with me too. Thanks! A little late but I am so excited to join this challenge! One of my goals this year is to shoot more film.